Metroidvania type game, in which we play the role of Haggis - a warrior trying to tear his son out of the claws of dark forces. Odallus: The Dark Call is an oldschool metroidvania game developed by an independent studio called JoyMasher. This Brazilian team specializes in creating retro games and its portfolio also includes such titles as Oniken and Blazing Chrome. 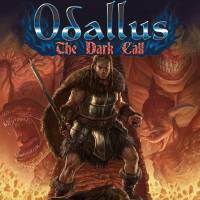 Odallus: The Dark Call takes players on a journey to a fantasy world controlled by the forces of evil. The main protagonist of the game is Haggis - a former soldier who abandoned the life of a warrior for a more peaceful life. When his son falls prey to the Darkness, the protagonist has no choice but to grab the sword again and face the danger in an attempt to save his child at all costs. In Odallus: The Dark Call the action is shown from the side perspective. There are eight levels to explore, the structure of which resemble a labyrinth; access to many places requires the prior acquisition of a key or a specific object granting Haggis a specific skill (such as the Golem's Band, which allows heavy objects to be moved). In addition to the exploration (following the formula introduced by games such as the older installments in the Castlevania series or the Ghosts'n Goblins series), players face numerous enemies they have to defeat using melee and distance weapons as well as spells. Moreover, during the adventure hero gains new pieces of armor to increase his defensive abilities. Among over fifty types of adversaries, there are the powerful bosses with greater attack power and resilience. In addition to the standard version of Odallus: The Dark Call, there is a Veteran Mode module with a much higher difficulty level. One has to finish the game in order to unlock it. Odallus: The Dark Call features 2D pixel-art visuals that evoke associations with the 8- and 16- bit games.